I’ve recently gone through a bit of a rough spot emotionally. I was busy, yes, with tech and performances for my play. But I’ve also just felt generally unmotivated and blah. So I’ve decided to organize my life a bit to add beauty and light to it. And there is one place that never fails to add beauty and light to my life: my lovely bathroom. I love the bathroom in our house. It’s all white, with clean white tile and a clean white tub and clean white walls. I’ve accessorized it minimally. It also had a skylight, which I highly recommend for any bathroom connoisseur. One thing it does not have is a bath tub, but ah well, one can’t expect utter perfection in a rental. But I decided to tweak it just a bit to make for a lovely relaxing sanctuary of a bathroom. I’ve decided to try balm cleansing with a homemade cleansing balm (recipe later, if I’m very nice), but balm cleansing requires a hot cloth. And hot cloth cleansing generally mucks up the cloth you use, so it requires lots of fresh cloths and a system for dealing with them. So I’ve devised a new system. 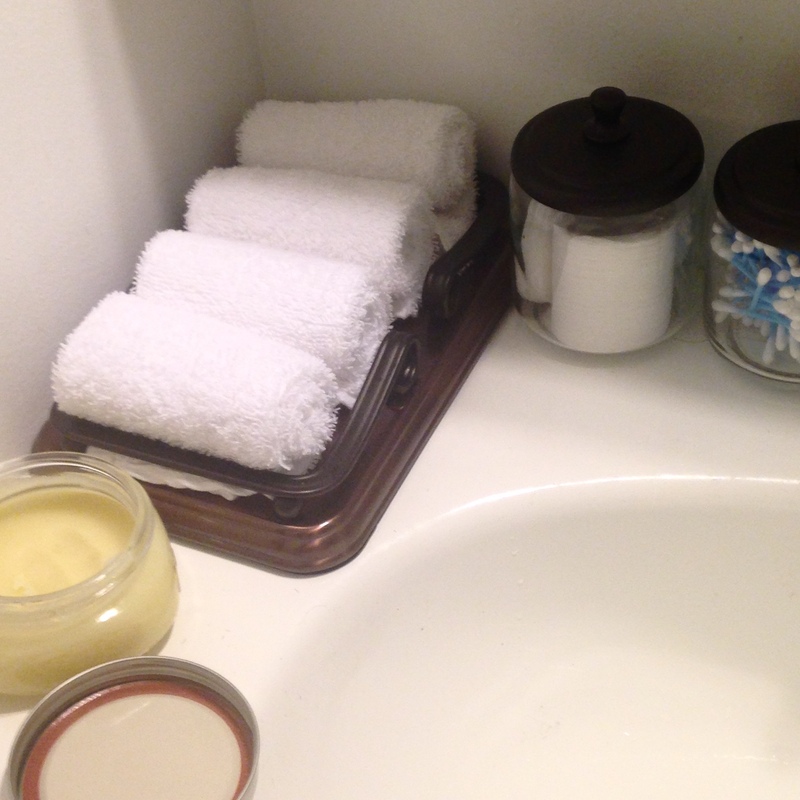 I have two dozen cotton washcloths that I laundered, rolled up, and set out, seven at a time, on the side of my sink. Next to that, I have my jar of cleansing balm, and jars of cotton pads and cotton buds. So every evening, I can remove my makeup, steam with a fresh cotton cloth, wash the day away, maybe tone with something delicious and rosewater-based, and dab away bits of eye makeup that escaped the balm with a cotton bud. Then, I proceed with moisture and oil. I’ve also found myself muddying my beauty routine in the name of novelty, so I’ve strived to simplify that as well. As of yet, I haven’t settled, but I’m trying one new thing at a time, rather than half a dozen. And it is much more relaxing. I hope to hear about all of your bathroom sanctuaries. Few things, seriously, calm my nerves and set right my mood (if not the world ;)) quite like organizing either. In fact, and I’m not even kidding here, I will usually try to leave one or more small organization jobs around the house just for times when this sort of therapy, if you will, is called for. Your evening power room routine sounds really lovely and delightfully lux, too, in no small part thanks to all of these plush white face towels (very spa-like). I hope that things will soon take a more positive path for you, dear gal, and that you’ll find your mood lifting. If you ever need to someone to chat with about anything, please know that I’m here for you. Thank you so much for your kind comments. Things are starting to look up. The room is very spa-like, and it helps that I feel better when I can keep my skin maintained. Thanks again.